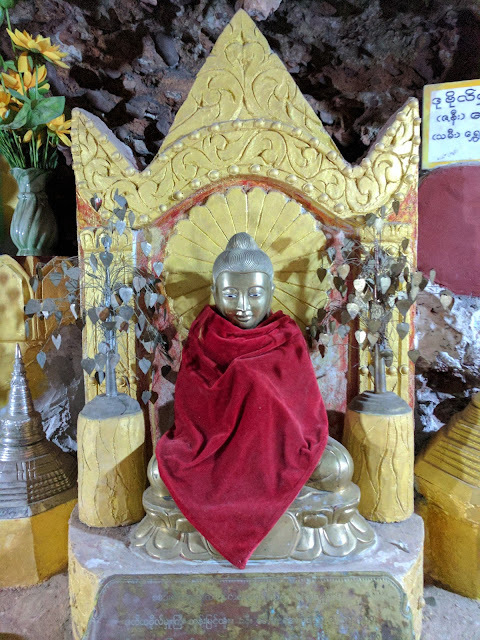 Per our hotel front desk’s suggestion, we walked to see the bamboo temple (but never found it) and the “small" cave temple Shwe Oo Min. It seemed quite substantial to us, with its winding pathways and multiple entrances/caves. Between the “Disco Temple,” bamboo temple, and cave, this town has a bit of a roadside attraction feel. Caroline says no more temples until Angkor Wat, as she's beyond templed out. 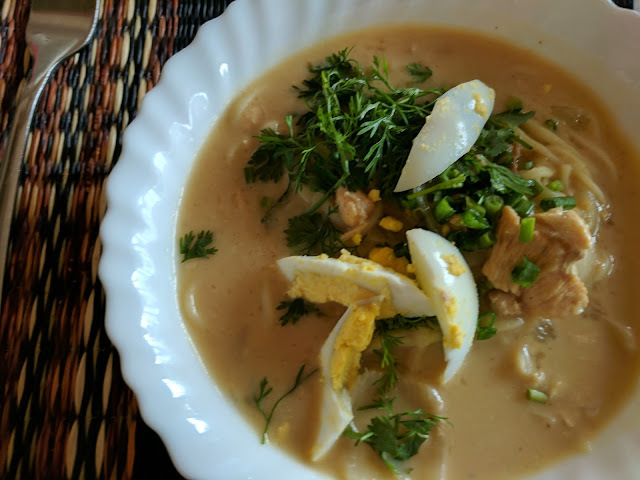 We had started our day with tasty bowls of Mohinga, the traditional, fishy noodle soup served for breakfast all over Myanmar. 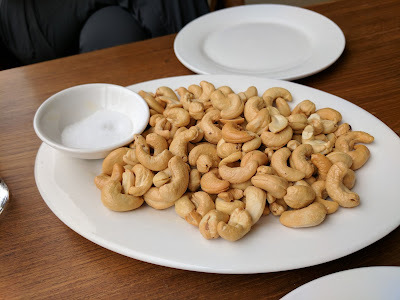 Lunch was a giant plate of fried cashews and lychee soda at Red House restaurant and bar, the place where we had dinner last night, owned by an Italian guy who reminded us of Mike Schaivo, a friend from our San Miguel days in Mexico. Greasy roasted cashews with "dipping salt" - delicious! After "lunch," I got my hair cut near the market, by the young apprentice (son, most likely) of the proprietor. He was extremely careful, taking his time. At least a half hour, probably more. The price for this meticulous cut was 1,500 kyat (approximately $1.10 USD). Caroline came to watch and take pictures, not expecting it to be so time consuming. Towards the end, the owner kindly invited her to sit inside out of the sun, even wiping down a chair for her to sit in. Such kind hospitality in this country, exhibited again and again. It’s hard not to love this place, for all its humble trappings. 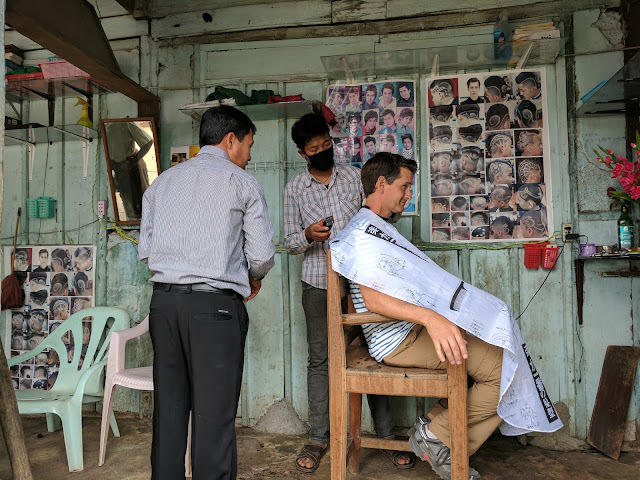 New Style Barbershop - the best haircut Scott's ever had in Myanmar! For cocktail hour, we headed over to Hi Bar, a hole in the wall that serves rum. 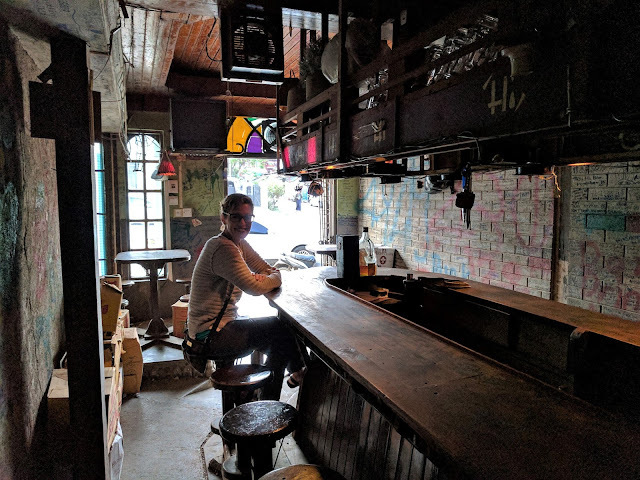 And only rum.The bartender/owner for 21 years, recommended his special rum sour, which was more like a (bad) mojito. We had two each, along with some delicious local potato chips and a dried, salty fish snack the barkeep gave us. He was an interesting guy with good English. He wanted to talk about Trump - they were rooting for Hillary. 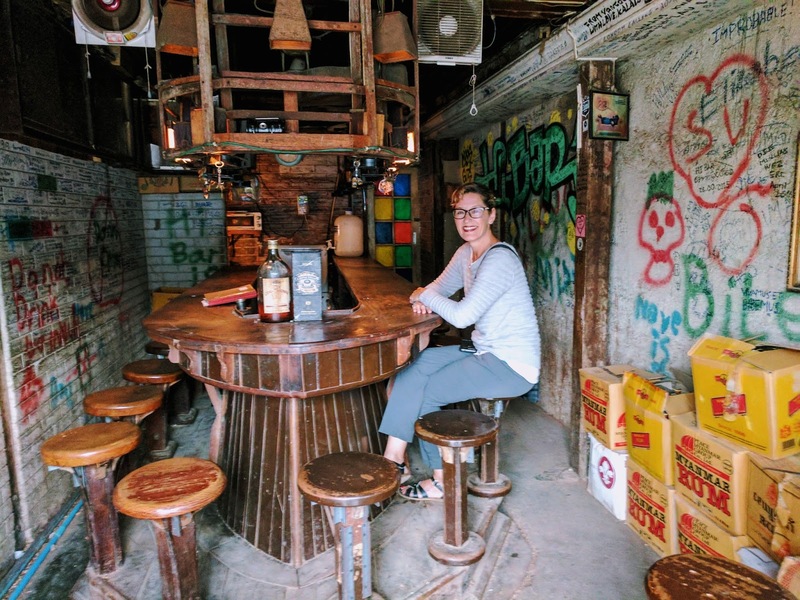 Standing at the back of the tiny bar, taking a photo out toward the entrance and street. The stools were so tiny and so close to the bar that we could barely squeeze our giant, western selves in. The locals streamed in and sat down for rum and water. Even cheaper than the cheap special, rum sours. 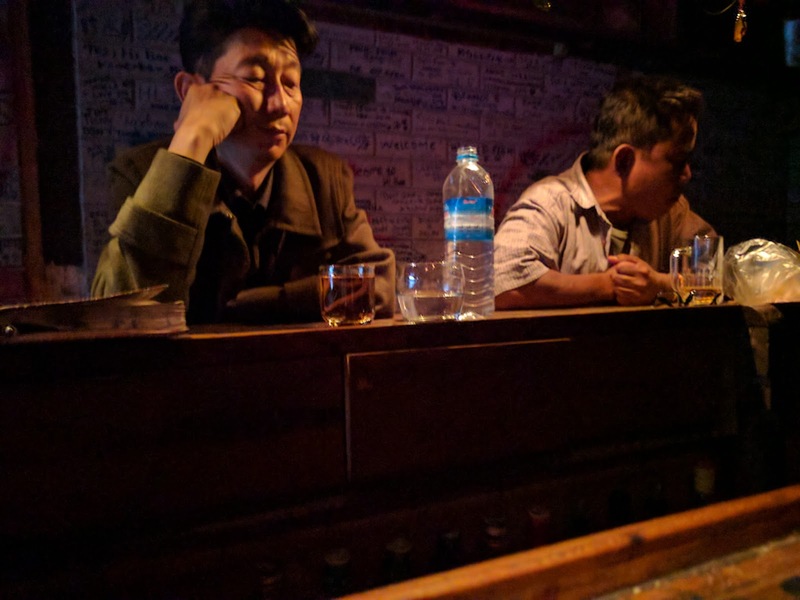 Hi Bar - Where locals go to Party! After our cocktail hour, we headed out for dinner at the place the front desk clerk at the hotel recommended for "local food," as opposed to Shan, whatever that means. The place was packed, and three big buses seemed to be waiting outside. We started wandering through to see if we could find a seat, and a waitress had us join another table where a family of three - a middle aged woman, a 20-ish gentleman, and a young girl - were just finishing up. The young man, "call me Ken," he said with a friendly smile, immediately started talking to us in pretty good English. Moving to our side of the table, he and what turned out to be his aunt, helped us order. We got the mutton curry (Indian style curry, not spicy, very tasty), tomato salad (also tasty and not spicy - peanut-y), and Caroline's risk mitigation sweet and sour chicken, which was decent, but may have been the spiciest of the three, ironically. The waitress then proceeded to put down a bowl of potato soup for each of us, along with 6 or 7 plates of different snacks and dips/sauces. The first one we tried was a super salty and spicy fish paste that we put on lettuce and cucumbers that almost blew Caroline's head off. It took her the rest of the meal to recover from one small bite. We chatted with Ken until they had to go. His grandma is an English teacher. 77 years old and still teaching. 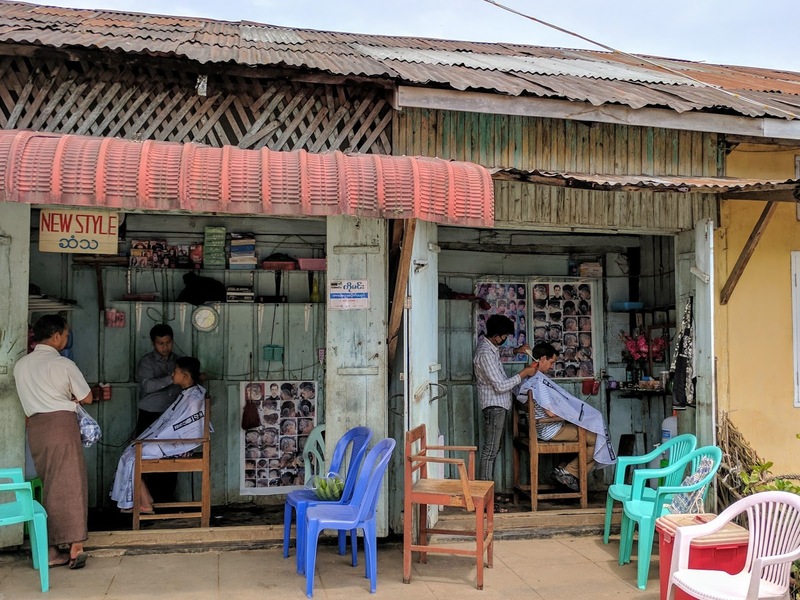 His aunt runs a hotel near Inle Lake. They had been traveling for the Thingyan holiday, all the way down to the southern peninsula of Myanmar that is shared with Thailand, on the Andaman Sea. He showed us some photos of gorgeous beaches that he had in his phone. 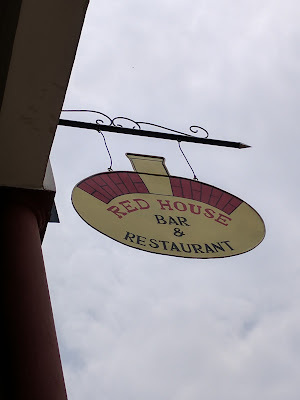 This was their final stop - dinner before heading home, which was the next town just 10 or 15 minutes east of Kalaw. Another example of the super-friendly Burmese people who seem extremely excited to have us in their country. Ken would love to come visit the US someday – “L.A.”! I hope he makes it.